Geeks need things to do to keep their skills up to date and marketers give them plenty of opportunity to fulfill their coding fixations. In this case, with the onslaught of ads on Facebook, the geek squad has developed several Firefox add ons which will remove ads from Facebook pages. 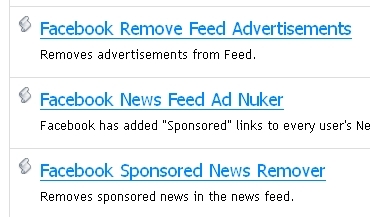 These tools allow for the removal of Sponsored News Lisitngs, Feeds Ads or, if one is so inclined, everything. Ah, but what's a Facebook experience without a little commerce plunked right in the middle of your friends newly added pictures, recent pokes and iLike queries? Come on, geeks, we want to be part of the Facebook party too. Don't hate on us.